Links to web sites that emphasize particular emperors. For beginners who ask "What should I collect?" Information about rarity and its importance for cost (for intermediate collectors). Commentary on a difference between collecting US and ancient coins. to help answer the question "What should I collect?" 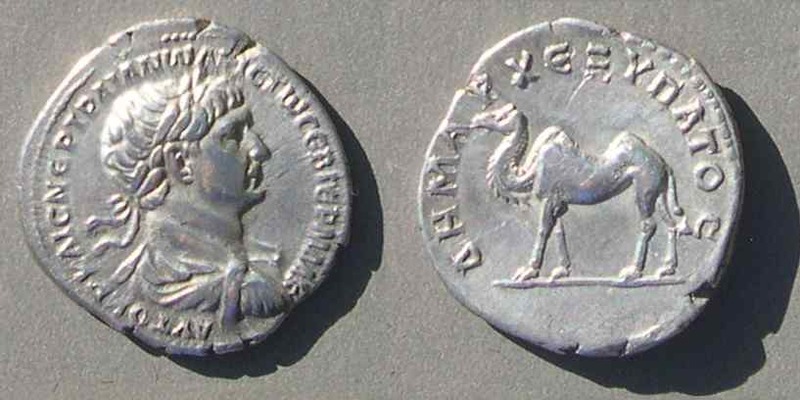 This coin: A silver Roman provincial coin of Trajan with a camel on the reverse, celebrating his annexation of Arabia in AD 106 . 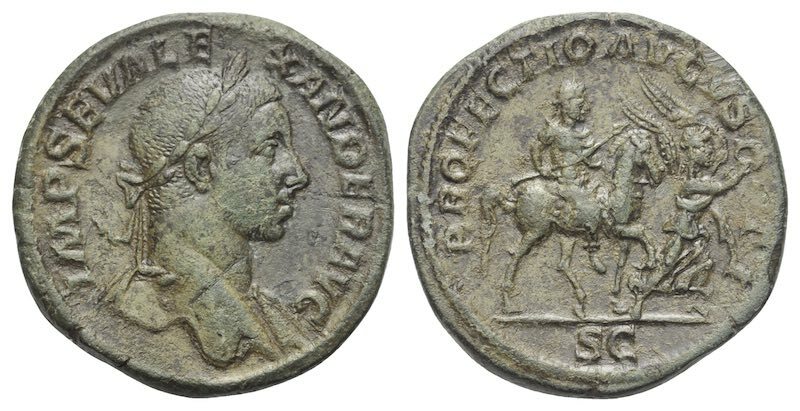 It could be part of a collection of imperial portraits, a collection of coins of Trajan, a collection of Roman provincial coins, or part of a collection of animals on ancient coins. 2019, Feb. 28: Several new pages on reverse types unique to a particular emperor. Feb. 1: This page rearranged. 2018, December: "Byzantine 'anonymous folles' of the 10th-11th centuries"
2018, August 5: Links to useful notes and printouts for a few good books, including the Seaby introductory series (Greek, Roman, Roman Provincial), SNG Copenhagen, BCD Pelopnessos, Celator index, SAN index, Ras Suarez' rarity rankings, Latin pronunciation, list of Greek authorities, a few legends of Roman Alexandria translated. Contents: Emperors, denominations, and themes: Pages in chronological order of the topic. Other: Ancient Imitations [a large site], Contents of Sale Catalogs (by firm)(by collecting theme). Click on the images to go to the pages. Republican coins are not explicitly dated, so how can we know their dates? A timeline page of examples and a page of theory. An illustrated discussion of the five time periods with the "quinarius"
This coin: 16-15 mm. Issue of the moneyer C. Fundanius, 101 BC. Geta, his portraits, 198-212 AD. Geta's portraits change as he ages from nine to twenty-two. This coin: His first portrait style. 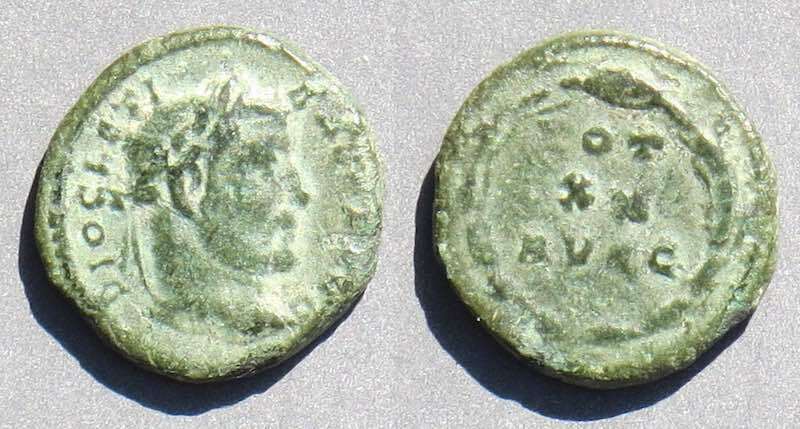 Severus Alexander (222-235) "year 5"
from two different years and two different mints. See the page with the explanation. This coin: A "year 5" coin struck in Rome for the mint of Alexandria, Egypt. Maximinus Thrax, the giant. Roman emperor 235-238. His portrait types. 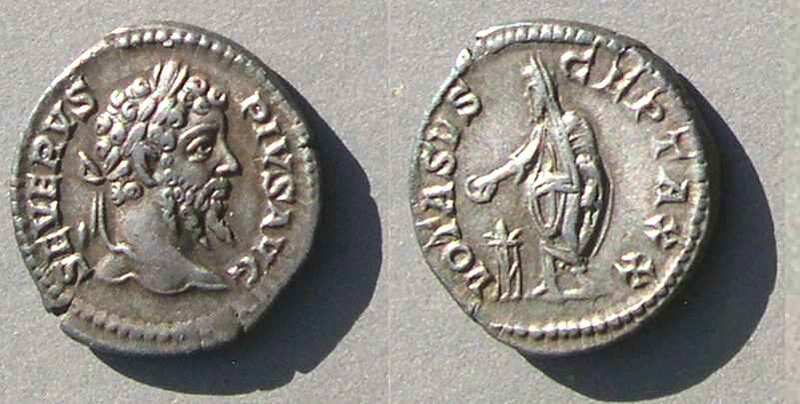 Maximinus Thrax issued denarii with three distinct portrait types. This coin: The early style portrait. This coin: Volusian, stuck at Antioch. An illustrated list of all the coin types of the Tripolis mint. An educational resource for collectors. 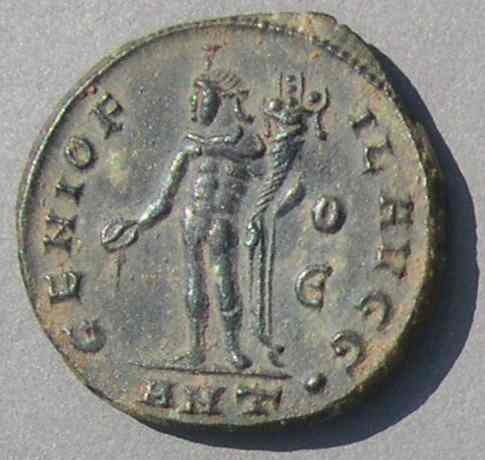 This coin: Tacitus, 276 AD. 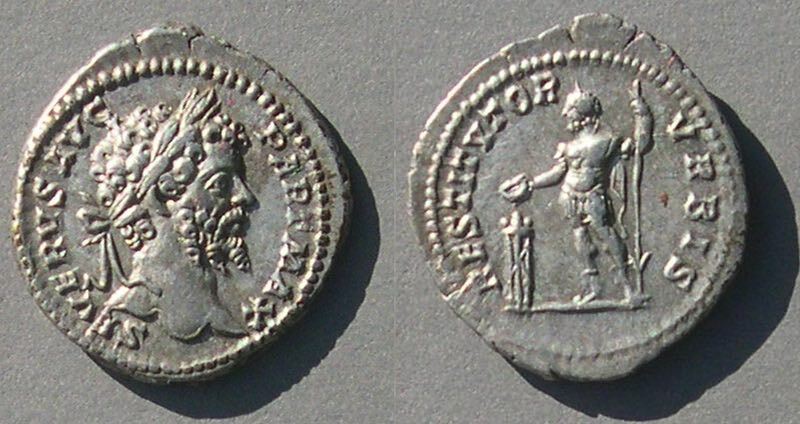 This coin: Maximian with mintmark incorporating ΛI, part of a code. GENIO POPVLI ROMANI, a common type under the tetrarchy (arranged by ruler). Portraits arranged by mint. 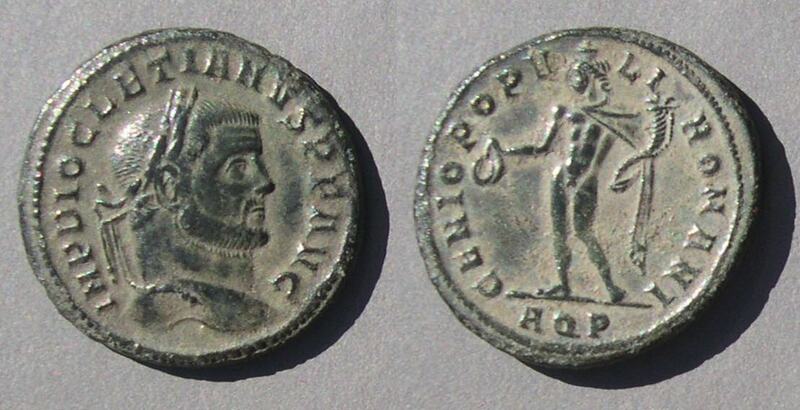 This coin says "MAXIMIANVS" but is of Galerius. Find out how to tell them apart. A rare follis type issued only at Trier. 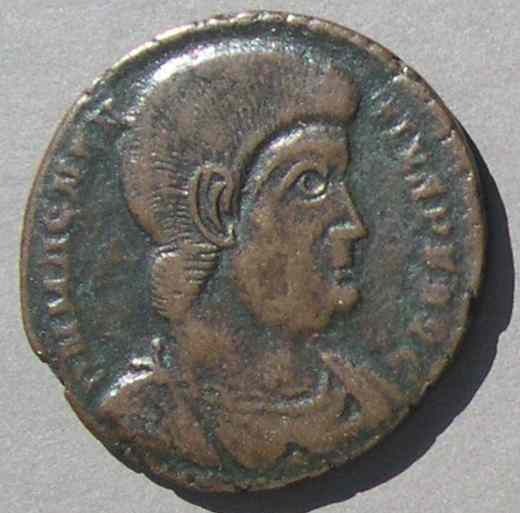 This coin: a small, 13 mm, fraction, struck for Diocletian, minted at Trier. An illustrated discussion of the history and types of the denomination. This coin: 20-19 mm. 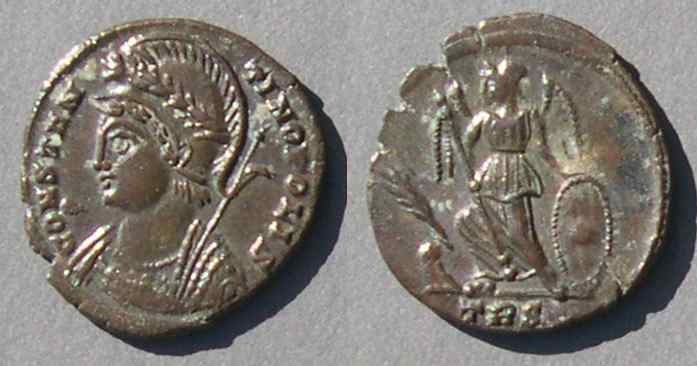 An argenteus of Diocletian, struck 96 (XCVI) to the pound of silver. 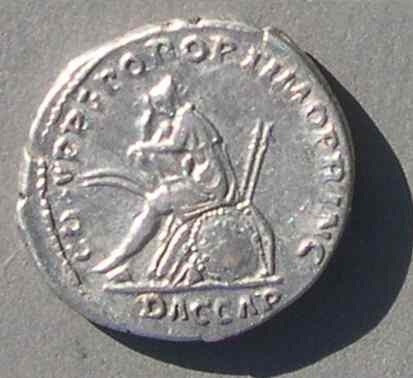 This coin: The usurper Domitius Domitianus at Alexandria, Egypt. An illustrated list of all the varieties. An educational resource for collectors. 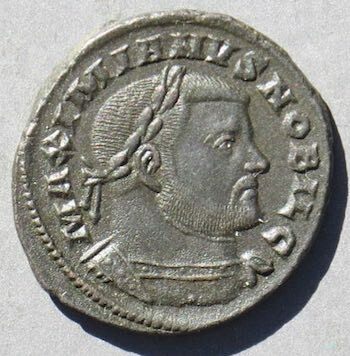 This coin: A quarter-follis of Maximinus II. also known as "pagan coinage of the Great Presecution of Christians" and as "Civic coinage." See this page with the types. when Constantine was awarded the unusual title "Filius Augusti". 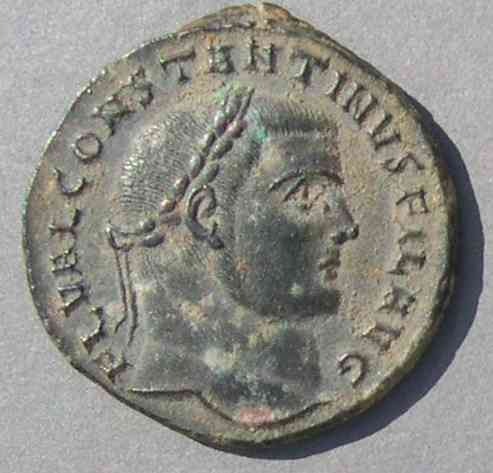 This coin: Constantine as "FIL AVG", minted at Antioch. the founding of Constantinople under Constantine. A short article here (only about this one common type). 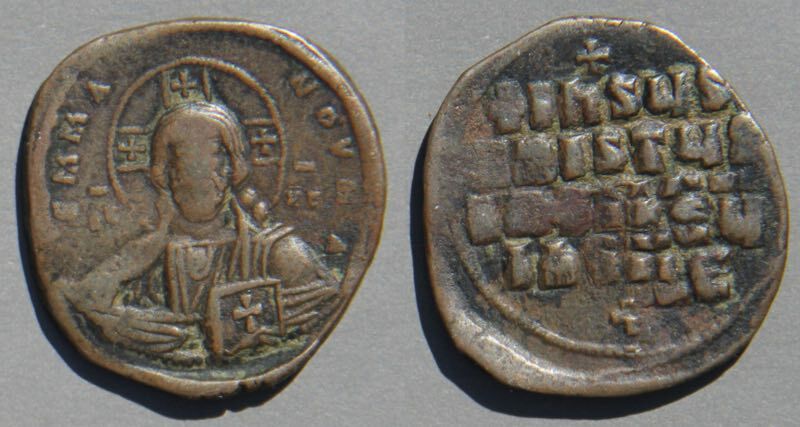 This coin: CONSTANTINOPOLIS/Victory, 330-340 AD. A complete list of types from its beginning under Constantine to 364 AD. A resource for collectors of late Roman AE coins. 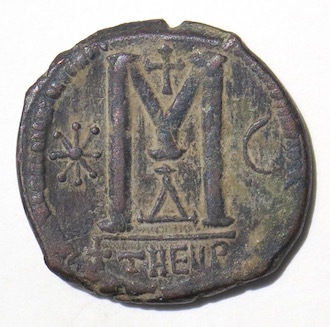 This coin: Magnetius, AD 350-353, with a Christian chi-rho reverse type. Long Mintmarks on Roman Imperial coins. A few of the longest mintmarks illustrated. 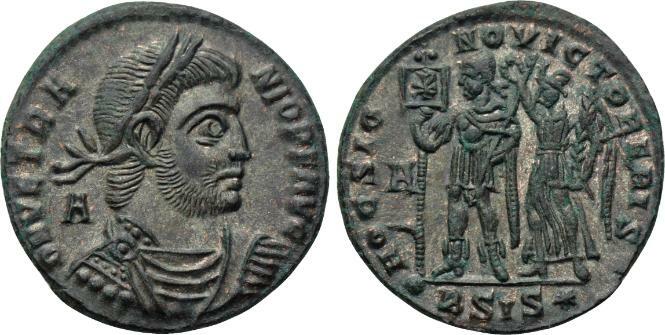 This coin: Julian II, "the Apostate", 361-363 AD. 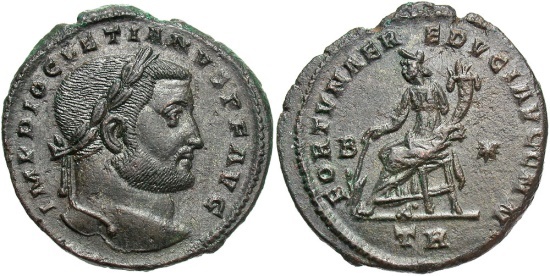 Vetranio, Roman emperor in AD 350: His six AE coin types. 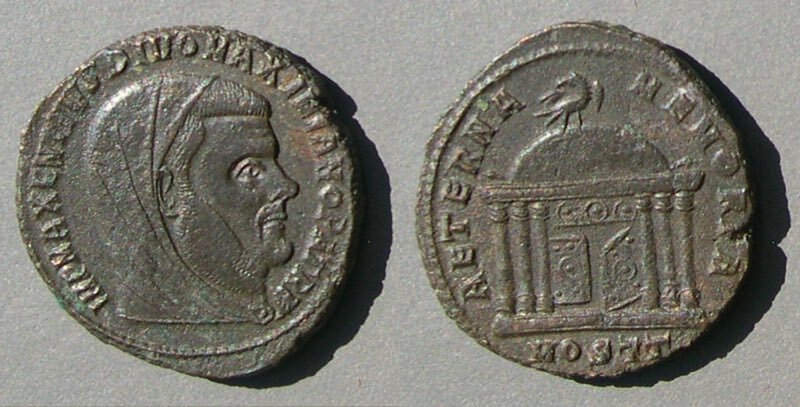 The Roman emperor Vetranio ruled in the Balkans for ten months in AD 350. His AE coin types are listed and illustrated here. 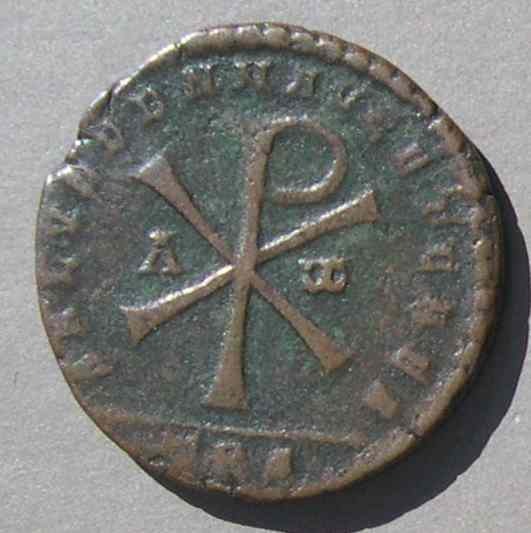 This coin: Vetranio with the famous early Christian "HOC SIGNO VICTOR ERIS" reverse. The Roman emperor Jovian reigned only eight months. 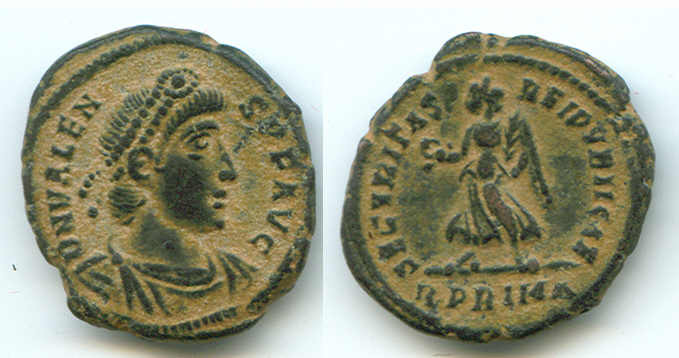 This coin: Jovian with reverse VOT/V/MVLT/X from Sirmium. The unusual use of officina numbers spelled out on issues of Valentinian, Valens, and Gratian. 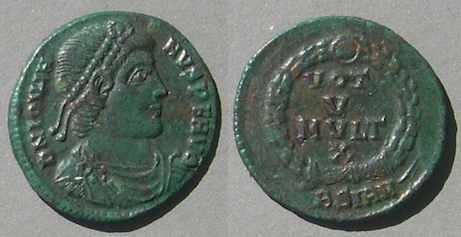 This coin: Valens, 364-378 AD, with officina PRIMA. 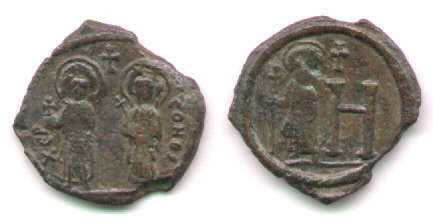 Byzantine copper coins with a cross above the head. An extensive collection of unusual cross-above head coins. 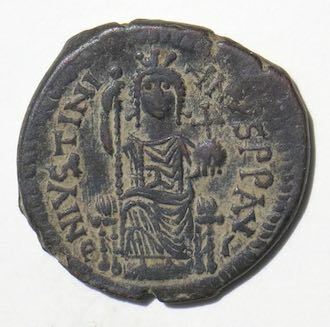 This Coin: Justin I (518-527), Sear 84, with a bold cross above his head. and the earthquakes at Antioch. The unusual Byzantine types from the city of Cherson in the Crimea. This coin: The "H" (= 8) pentanummia denomination. The site illustrates all the types, explains attributions and dates, gives their frequencies, and tells their stories here. 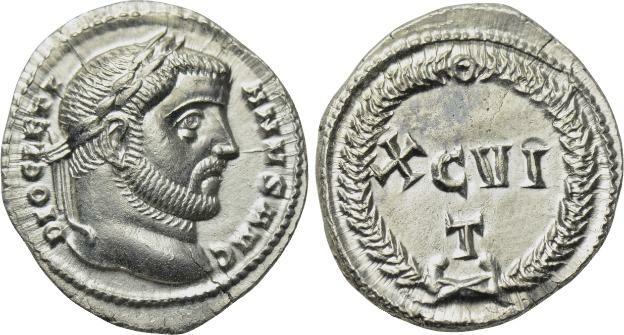 Can you think of one emperor who issued coins from one mint with more than five distinctly different mintmarks? Date: Entire Roman imperial period. in a quiz format (with immediate answers). Can you recognize them? This type: Captive seated on a pile of arms. DAC CAP in exergue. The large site about vows recorded on Roman coins is here. Septimius Severus (193-211) sacrificing at the ceremony celebrating making it to 10 years, while renewing his vows to 20 years. This type was used on the coins of only two empresses. 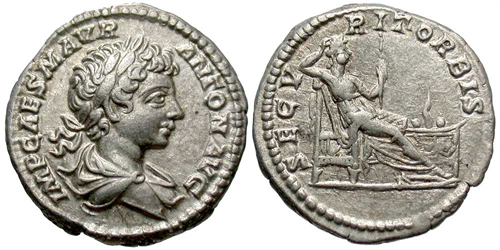 This coin: A silver denarius struck for Faustina, Jr., wife of Marcus Aurelius. This coin: Septimius Severus (193-211) returns to Rome in 202. 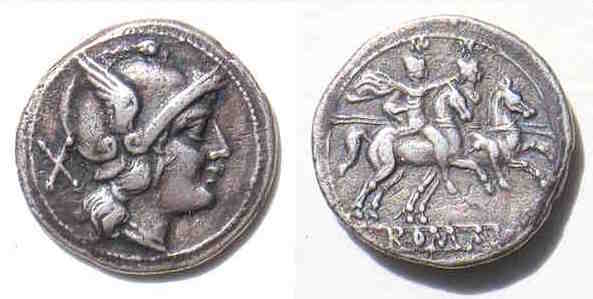 This coin: Severus Alexander (222-235), lead by Victory, departs for war in the east. The real meaning of SECVRITAS on Roman coins. 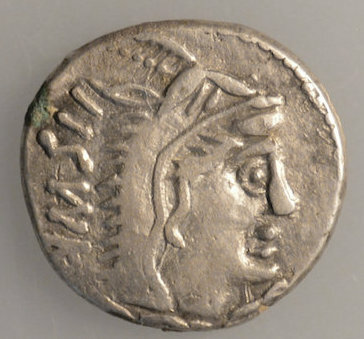 An educational site about genuinely ancient coins that were imitations or counterfeits in their day. 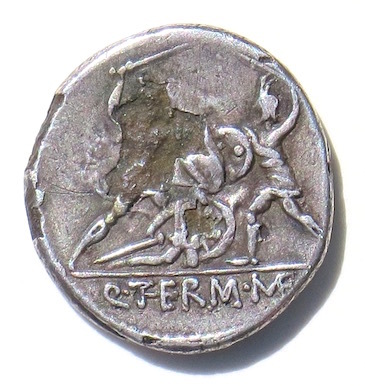 This coin: An ancient counterfeit Roman Republican denarius. 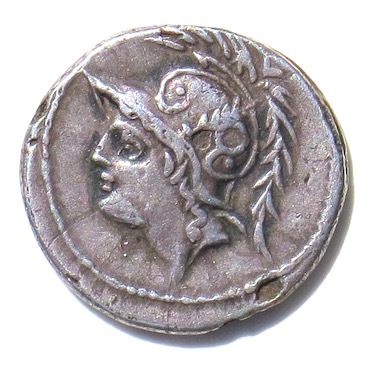 An educational site for ancient coin collectors about sale catalogs. A related site where catalogs are grouped by collecting theme. This catalog: M&M 37, Basel, Switzerland. The end of the table of contents for the educational site. 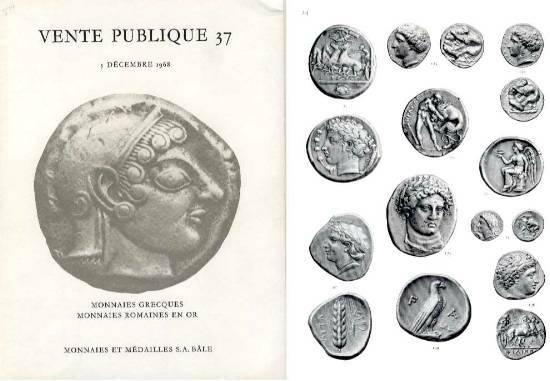 Here are ancient coins and related literature for sale.